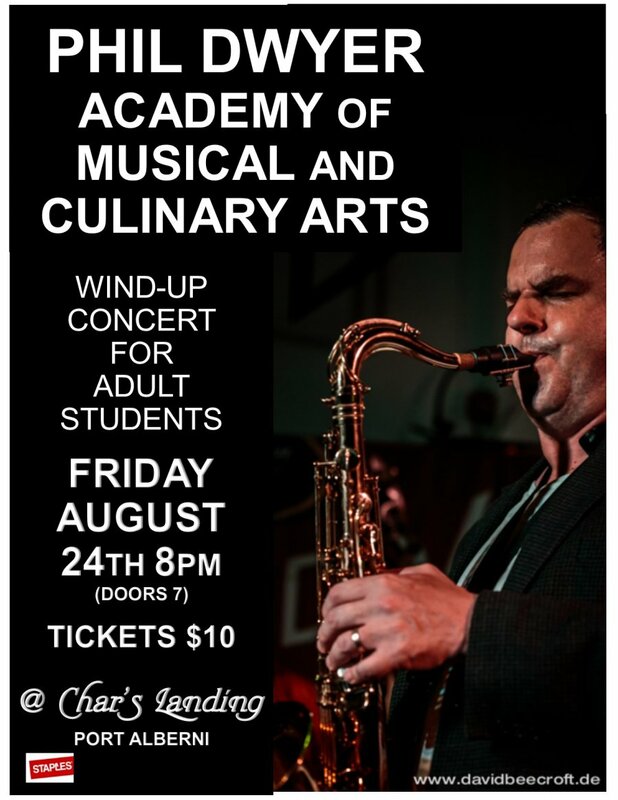 Back 2005 JUNO Award winner Phil Dwyer and his wife Theresa opened the Phil Dwyer Academy of Musical Culinary Arts in their Qualicum Beach home. Between 2005 and 2009 the camp grew from eight students in their living room to over 100 students and a couple of dozen faculty, and a month-long music festival. From 2011-2014 Phil’s schedule precluded taking on such an ambitious program, but the PDAMCA adult camps continued, with participants from across Western Canada meeting in Qualicum to share their love of music and enjoy delicious food prepared by guest chefs. Most of the participants have careers outside of music, or are retired, but play at a very high level, and their wind-up performances were always a highlight of the summer for Oceanside music fans. Over a dozen gifted musicians will perform in various configurations playing classic swinging jazz arranged especially for this evening’s performance.